The EU needs to give citizens more of a say if it wants to fight populist forces in the next election, EU Commissioner, Pierre Moscovici, has insisted. "If I were a candidate in the European elections, I would say ‘take back control for citizens’,” he said during a conversation with Friends of Europe in Brussels on 21 November. According to Friends of Europe’s recent #EuropeMatters poll, 64% of Europeans are not convinced that life would be worse without the EU, while 49% think the EU is irrelevant. “These European elections are going to be the most important ever – probably the most delicate and, frankly, they might be the most dangerous,” Moscovici warned. Doubling down on the Commission’s handling of the ongoing budget stand-off with Italy, Moscovici urged the government to respect the EU’s debt reduction rules by saying that blackmail of any kind would not be tolerated, adding he was not “convinced” by the government’s growth projections. 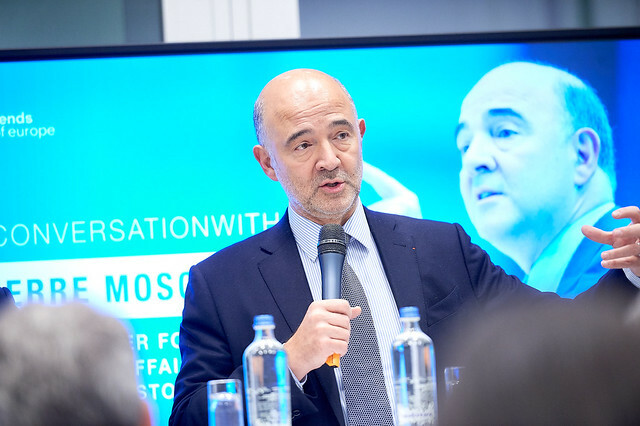 With the March departure date for Brexit rapidly approaching, Moscovici said that it would be crucial to push for a strong eurozone with its own budget, finance minister and monetary fund, all of which should be overseen by MEPs. He also expressed a desire to replace unanimity with majority voting on tax matters, saying that he would table a number of proposals before he leaves office. “The files are ready."